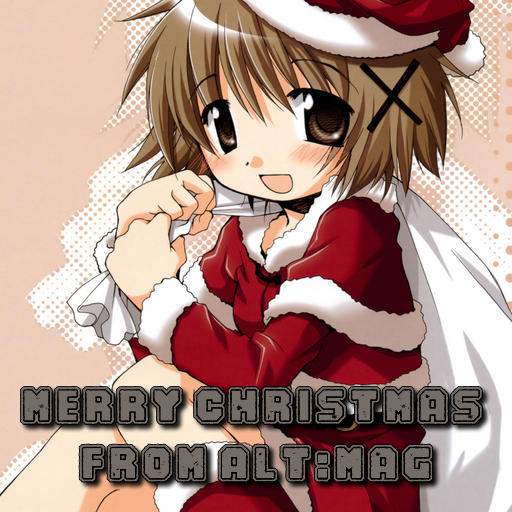 Merry (Second) Christmas from Alt:Mag! Hello everybody and Merry Christmas! Last Christmas I sat on the uncomfortable sofa at my Grandparent's house and typed out a short and sweet 'Merry Christmas' post via my Dad's iPad. This year, thanks to the wonders of BT wi-fi, I am using a laptop. Thank goodness for that... the blogger app needs to be fixed if you ask me. But thinking back to that time, a lot has really changed. Alt:Mag became a proper website with its own domain name, the website got a cool new layout (sorry about the pink, but I honestly still think it looks cool) the purpose of the project shifted more from an actual magazine to an online blog, we got cool t-shirts and stickers printed, we raised awareness for our cause at MCM expo and we gained a handful of great new team members! But probably the coolest thing that happened this year though was reaching 50,000 all-time views on the website... and we're already 3,000 away from 60,000! Super awesome. To all those people who like this blog, check it out and support it by reading our content, we (the Alt:Mag team) cannot thank you enough. You are what make this whole journey feel worthwhile. At the same time, I have changed a lot too. I passed my exams which I never thought I'd ever pass and have started to attend university. It it a totally incredible yet bizarre experience, but I think I have been able to pull through. I've met a plethora of wonderful people who are themselves interested in what we do here at the magazine, and have gone as far to team up for certain things and even help to promote us. I realise that I have been taking a little bit of a break from my job as editor as I have been stuck for ideas and have been a little bit distracted by my work and a very special someone, but I promise in the New Year I will up my game and get everything sorted out that has yet to be sorted. Us guys here at Alt:Mag hope the rest of your December is lovely and we hope this New Year fills your life with love and happiness. Perhaps we'll even get peace on earth. Now that's something we can all look forward to. We hope you keep on reading, and check out our friends on the sidebar if you have any time today!